Gent is in many ways an innovative city. One of these ways is that the city has been supporting and promoting the consumption of less meat. Since 2009 the city supports “Donderdag Veggiedag”, meaning the active promotion of eating vegetarian for (at least) one day in a week. This also means that in all school restaurants and office buildings of the city of Gent no meat is served on Thursdays. This is an enormous step in reducing the consumption of meat and thus saving a little bit of our planet. 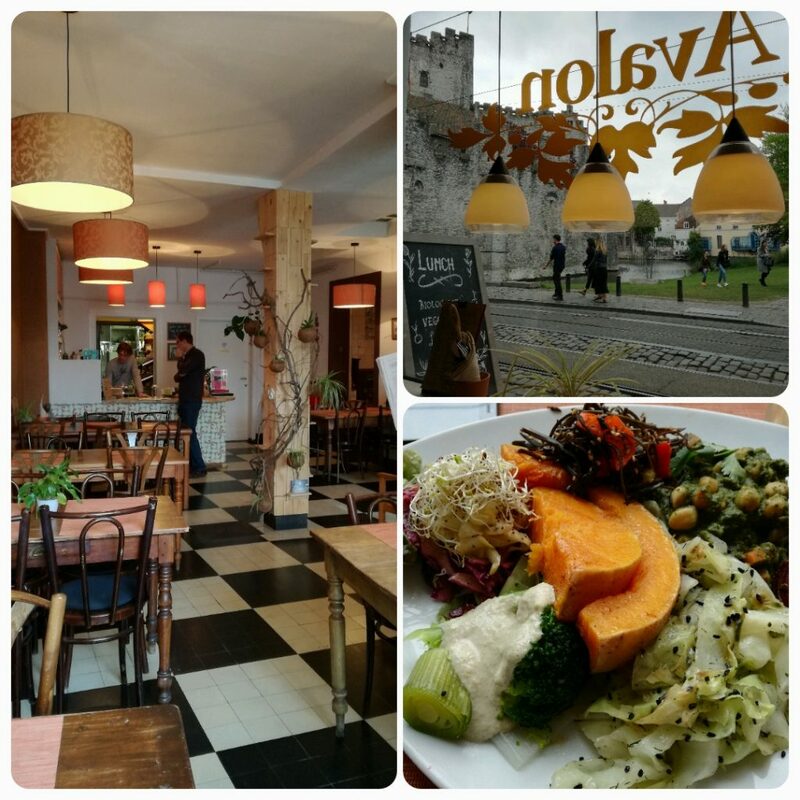 Gent also has an enormous amount of veggie(friendly) and vegan(friendly) restaurants: 130 restaurants serve vegetarian food, 44 are veganfriendly and 15 are totally vegan! We decided to test out a few, together with our meatloving 6 year old… and we managed to find something she liked in each one of them. Here’s our choice! 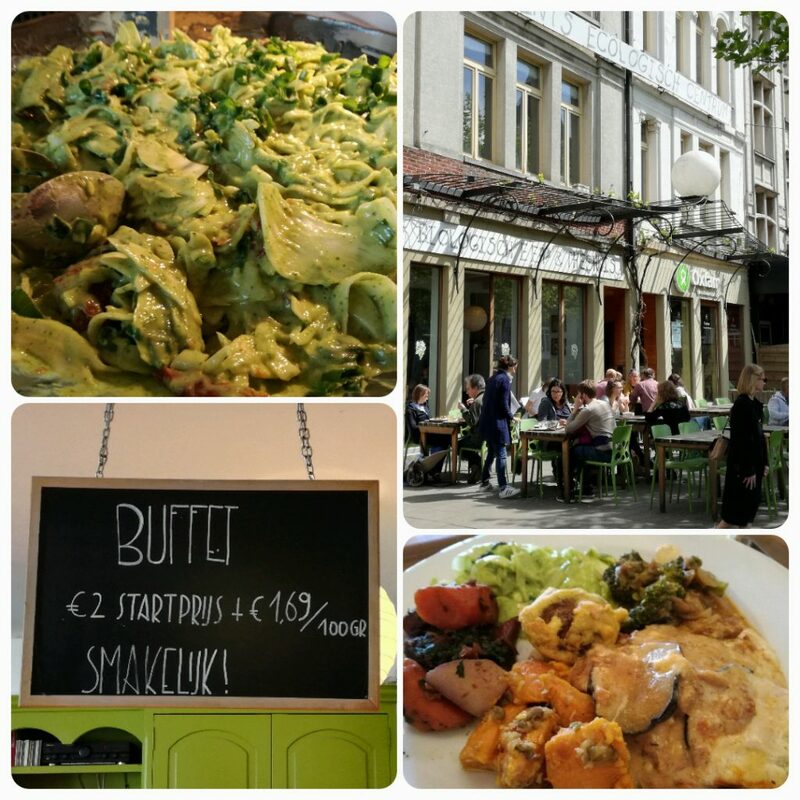 Situated in front of the main trainstation (St. Pieters), this restaurants serves a buffet-style meal. You start at a basic price of €2 for the warm buffet, and you pay extra for each 100gr you add to your plate. They also have a salad bar that works the same way. If you can’t find anything you like in those options, you can always order a pasta bowl, some fries or make your own sandwich. We found the concept of paying for what amount of food you eat very charming. They day we were there, there was a variety of great dishes in the warm buffet, like carrots with spinach and almonds, a great vegetarian moussaka (with minced tofu as a meat replacement), broccoli with seitan and a mild spicy sauce and sweet potatoes with coconut. What also appeals to us, is that Lekker Gec also is a social restaurant. They combine great food with employment programs for people who’ve been unemployed for a while. An added bonus! This cosy restaurant, in front of the city’s Castle of Counts, has been around for quite some time. The menu is simple: you have the dish of the day, which gives you a mix of various small dishes on one plate. Or you could go for the vegetarian lasagna or the veggie seitan stew, with a brown beer sauce. 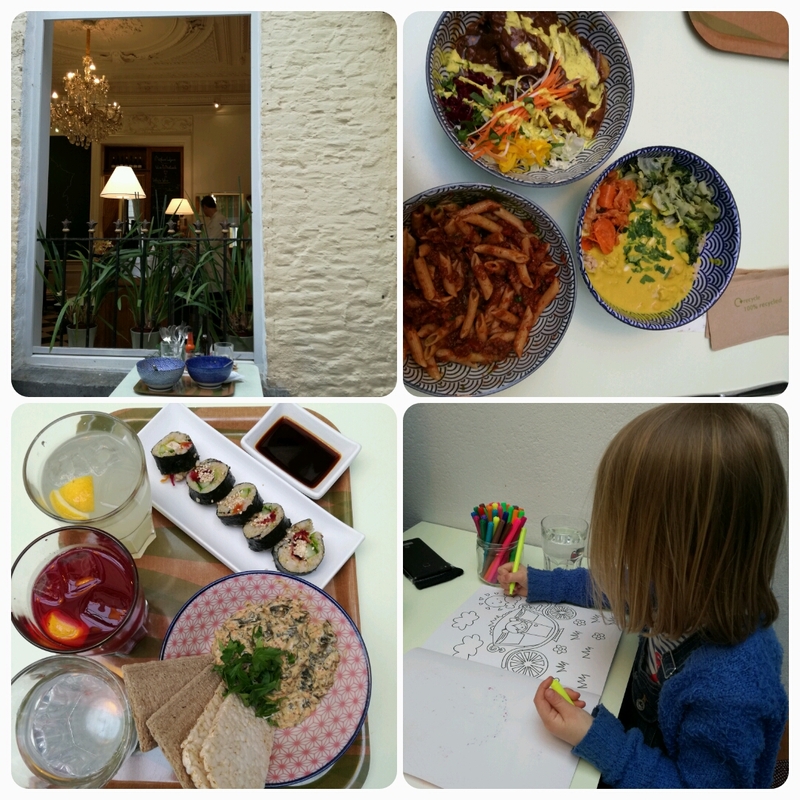 All main dishes set you back around €18 and they have an option to get it all in childrens size as well. The restaurant only does lunch. We chose one of each option and liked the seitan stew the most. It comes with a selection of a few of the vegetables you get in the dish of the day as well. For Febe the lasagna wasn’t easy, because the top layer was quite spicey. Best to check for that when you order a childrens portion. If you are in Belgium, you need to have some fries. And if you want to go veggie or vegan, you need to be at the Frietketel. Located a small walk from the city centre (in Papegaaistraat, about 15 mins walk from the Graslei) this fries shop has the widest selection of veggie snacks and burgers in the city. They fry in palm oil and have a great vegan tartare sauce to go on top of your fries. Located in Hoornstraat, a side street of the main shopping street in Gent, this cosy wine bar has a wide menu of bowl food. They have two bars, one in Gent, and one in New York. We decided to go for the ‘Veggie sushi roll’ and the ‘Seaweed tartare’ as starters. As mains we opted for the ‘Pasta al mafiosi’ for our 6yo, and we picked the ‘Tibetan mama’ and ‘Jeff’ as mains. Since we were driving, no wines for us. But there was no need to be sad for that, since Le Botaniste also has a great homemade lemonade and some lovely detox juices. This all set us back for just under €50 (€48,65 to be precise), a very reasonable price for a two course dinner with 3. We found the starters incredible. 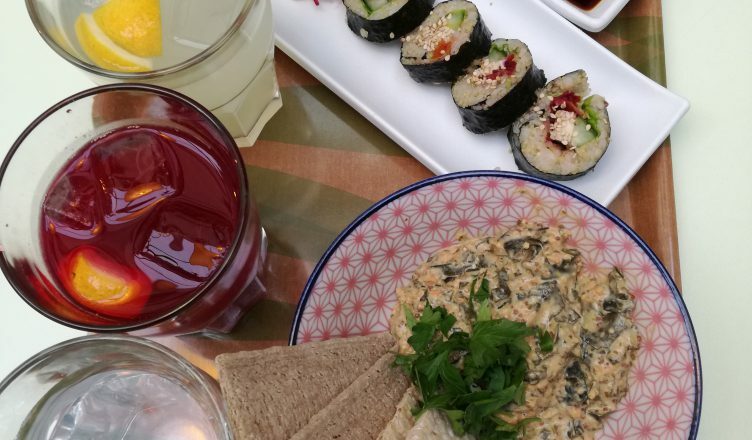 We’re big sushi fans, but to be honest we didn’t miss the fish in it at all. We did miss some wasabi though. The Seaweed tartare was divine and for us the biggest discovery of the evening. Our mains were simply good, although we weren’t big fans of Jeff – but that’s more personal taste I guess. The bar provides a colouring book and color pens, which kept Febe entertained in between courses. A big plus for that! If you plan to stay overnight, we suggest you give Aanaajaanaa B&B a closer look. This cosy bed and breakfast is ecological and biological and they serve a vegan breakfast. 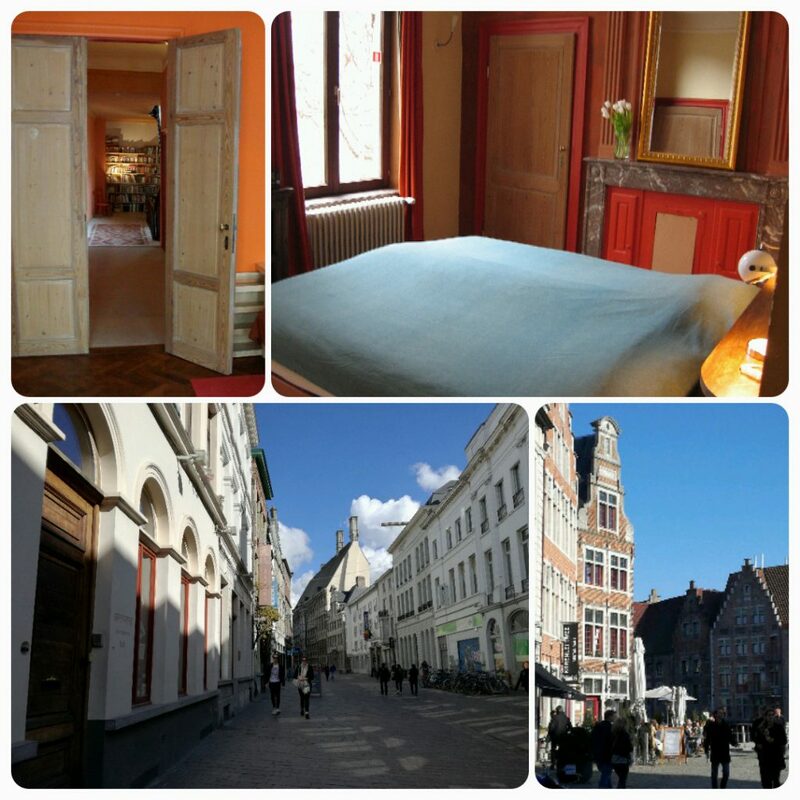 Their location is fabulous: in the car-free street Hoogpoort, near the city hall and just a minute’s walk away from Groentemarkt, Gravensteen, Korenmarkt, Graslei and Korenlei. You can’t stay in a better location! From 13/05/2017 untill 27/05/2017 you can enter our competition to win one night for two persons in Aanaajaanaa. Surf to our Facebook page for more information! below you will automatically get a list of the restaurants of your choice. You can click on the name for a map with the location and the restaurants website.